Upon stepping into amy’s candy bar you will be transported into a colorful and cheerful world of all things candy. Reminiscent of the candy shops that were once found on virtually every corner in Chicago, amy’s candy bar offers a wonderful mix of sweets including hard to find nostalgic and imported candy, unique chocolates, gummis galore and an impressively large assortment of licorice from all corners of the world. Best of all are amy’s small batch, hand-crafted caramels and confections produced in the kitchen within the shop. Amy selects the highest quality ingredients to create her little masterpieces. one taste of these delectable sweets will leave you wanting more! Amy’s initial inspiration came from her grandmother geraldine who was an avid baker. intrigued by everything her grandmother made, amy would stand side-by-side with her in the kitchen with watchful eyes. Originally from Wisconsin, amy graduated from Hamline University in St Paul, MN with a degree in psychology and marketing. Although amy would go on to work in corporate America after college, her true passion was crafting sweets. In 2006, amy decided to leave her corporate job and enroll in the French Pastry School in Chicago. After graduating, she returned to the corporate world and put candy making on the back burner. 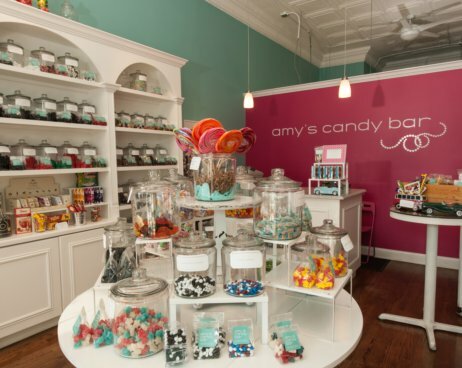 finally in 2011, Amy decided to fulfill her dream and open her own shop... amy’s candy bar! Since graduating from the French Pastry School, Amy has continued her confectionery education by studying under chef regis bouet, chocolatier and pastry chef for l'institut national de la boulangerie pâtisserie and under chef lionel clement, lenotre disciple and founder of nuubia chocolat. Amy’s candy bar has garnered national and local attention including Food & Wine’s 2012 Top Five New Candy Shops and was voted by Time Out Chicago Kid’s Magazine as Chicago’s Coolest Candy Store.